"The triple factors of motivation: Purpose, Autonomy, and Mastery." Rivalries, intrigue, and fraud in a burgeoning field of research. "As the researchers studied the groups, however, they noticed two behaviors that all the good teams generally shared. First, on the good teams, members spoke in roughly the same proportion, a phenomenon the researchers referred to as ‘‘equality in distribution of conversational turn-taking.’’ On some teams, everyone spoke during each task; on others, leadership shifted among teammates from assignment to assignment. But in each case, by the end of the day, everyone had spoken roughly the same amount. ‘‘As long as everyone got a chance to talk, the team did well,’’ Woolley said. ‘‘But if only one person or a small group spoke all the time, the collective intelligence declined.’’ Second, the good teams all had high ‘‘average social sensitivity’’ — a fancy way of saying they were skilled at intuiting how others felt based on their tone of voice, their expressions and other nonverbal cues. One of the easiest ways to gauge social sensitivity is to show someone photos of people’s eyes and ask him or her to describe what the people are thinking or feeling — an exam known as the Reading the Mind in the Eyes test. People on the more successful teams in Woolley’s experiment scored above average on the Reading the Mind in the Eyes test. They seemed to know when someone was feeling upset or left out. People on the ineffective teams, in contrast, scored below average. They seemed, as a group, to have less sensitivity toward their colleagues." "Within psychology, researchers sometimes colloquially refer to traits like ‘‘conversational turn-taking’’ and ‘‘average social sensitivity’’ as aspects of what’s known as psychological safety — a group culture that the Harvard Business School professor Amy Edmondson defines as a ‘‘shared belief held by members of a team that the team is safe for interpersonal risk-taking.’’ Psychological safety is ‘‘a sense of confidence that the team will not embarrass, reject or punish someone for speaking up,’’ Edmondson wrote in a study published in 1999. ‘‘It describes a team climate characterized by interpersonal trust and mutual respect in which people are comfortable being themselves.’’" "There was nothing in the survey that instructed Sakaguchi to share his illness with the group. There was nothing in Project Aristotle’s research that said that getting people to open up about their struggles was critical to discussing a group’s norms. But to Sakaguchi, it made sense that psychological safety and emotional conversations were related. The behaviors that create psychological safety — conversational turn-taking and empathy — are part of the same unwritten rules we often turn to, as individuals, when we need to establish a bond. And those human bonds matter as much at work as anywhere else. In fact, they sometimes matter more. ‘‘I think, until the off-site, I had separated things in my head into work life and life life,’’ Laurent told me. ‘‘But the thing is, my work is my life. I spend the majority of my time working. Most of my friends I know through work. If I can’t be open and honest at work, then I’m not really living, am I?’’"
23 years in the FBI taught this entrepreneur the remarkable power of observation. Raise your children right by doing these things: 1. Set a great example. 2. Take responsibility. 3. Seek to serve others. 4. Practice daily gratitude. 5. Let others solve their own problems. Improve your resiliency--or teach your kids to be mentally tougher--with these important practices. 1) Be driven but kill the ego. Stay humble. 2) Take extreme ownership. No blaming whatsoever. Andrew Ng: "When I think about what to do with my own life, what I want to work on, I look at TWO CRITERIA. The first is whether it's an OPPORTUNITY TO LEARN. Does the work on this project allow me to learn new and interesting and useful things? The second is the POTENTIAL IMPACT. The world has an infinite supply of interesting problems. The world also has an infinite supply of important problems. I would love for people to focus on the latter." "I believe that the ability to innovate and to be creative are teachable processes. There are ways by which people can systematically innovate or systematically become creative." On information diet: "I read a lot and I also spend time talking to people a fair amount. I think two of the most efficient ways to learn, to get information, are reading and talking to experts. So I spend quite a bit of time doing both of them. I think I have just shy of a thousand books on my Kindle. And I've probably read about two-thirds of them." "I don't know how the human brain works but it's almost magical: when you read enough or talk to enough experts, when you have enough inputs, new ideas start appearing." 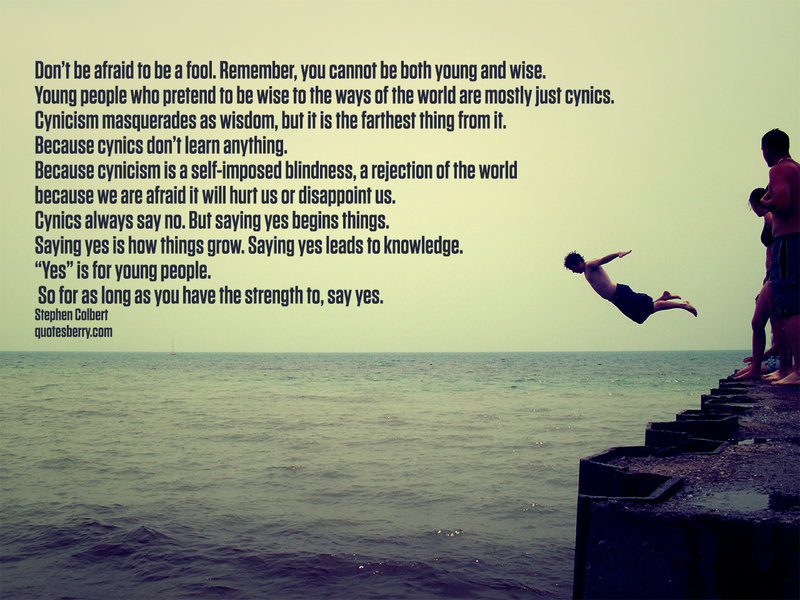 "I wish we as a society gave better career advice to young adults. I think that "follow your passion" is not good career advice." On failure: "... one pattern of mistakes I've made in the past, hopefully much less now, is doing projects where you do step one, you do step two, you do step three, and then you realize that step four has been impossible all along. I talk about this specific example in the strategy innovation workshop I talked about. The lesson is to de-risk projects early." On relying on good habits instead of willpower: "People that count on willpower to do these things, it almost never works because willpower peters out. Instead I think people that are into creating habits -- you know, studying every week, working hard every week -- those are the most important. Those are the people most likely to succeed." 1. Work super hard. 2. Attract great people. 3. Focus on the things that actually make a difference. 4. Don’t just follow the trend. 5. Take risks. Seek internal strengths, not outward praises. "You’ve observed that Ivy League students have an internal struggle with both “grandiosity and depression.” Can you explain this further? Alice Miller wrote about this 30 plus years ago in the classic The Drama of the Gifted Child, but I had to experience it to see it for myself. The grandiosity is that sense of “you’re the greatest, you’re the best, you’re the brightest.” This kind of praise and reinforcement all the time makes students feel they’re the greatest kid in the world. And I would say that this is even worse than when I was a kid. Now there’s a whole culture of parenting around this positive reinforcement. These kids were always the best of their class, and their teachers were always praising them, inflating their ego. But it’s a false self-esteem. It’s not real self-possession, where you are measuring yourself against your own internal standards and having a sense that you’re working towards something. It’s totally conditional, and constantly has to be pumped up by the next grade, the next A, or gold star. As Miller says, what you’re really learning is that your parents’ love is conditional on this achievement. So when you fail, even a little bit, even if you just get a B on a test, or an A- on a test, the whole thing collapses. It may only collapse temporarily, but it’s a profound collapse—you feel literally worthless. These are kids who have no ability to measure their own worth in any realistic way—either you are on top of the world, or you are worthless. And that kind of all or nothing mentality really pervades the whole system. It’s also why it’s Harvard or the gutter: If you don’t get into Harvard, Yale or Princeton, it’s a disgrace. If you go to Wesleyan, you can never show your face in public again." William Deresiewicz explains how an elite education can lead to a cycle of grandiosity and depression. “It ain’t what you don’t know that gets you into trouble. It’s what you know for sure that just ain’t so.” — Mark Twain "It’s never been easier to fake knowledge than it is now. You can pop open a Wikipedia page and within a few minutes feign competence. If you do this a few times and you don’t get called out, you come to believe that you’re actually pretty competent in something you really have no clue about." Dalai Lama: How to deal with Anger. "We live in the culture of the Big Me. The meritocracy wants you to promote yourself. Social media wants you to broadcast a highlight reel of your life. Your parents and teachers were always telling you how wonderful you were. But all the people I’ve ever deeply admired are profoundly honest about their own weaknesses. They have identified their core sin, whether it is selfishness, the desperate need for approval, cowardice, hardheartedness or whatever. They have traced how that core sin leads to the behavior that makes them feel ashamed. They have achieved a profound humility, which has best been defined as an intense self-awareness from a position of other-centeredness."